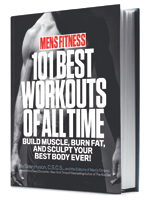 101 Best Workouts of All Time is the ultimate answer to the question “What workout should I do?” No matter what equipment you have available, from a fully stocked supergym to a pair of mismatched dumbbells in your garage, or nothing but your body weight alone, you can build muscle, lose fat, and sculpt the physique you’ve always wanted. Training your abs like a bodybuilder can lead to a good-looking six-pack. But training your abs like an athlete makes for a six-pack that can also perform. Speed, strength, and the ability to explosively move in all directions comes from the core, or rather, a core that is trained for those qualities. Combination moves, where you pair up different exercises to form one uber-lift, train the core to stabilize you during complex movements. This workout also pays attention to the core’s many functions—flexing the spine, controlling its extension, twisting the torso side to side, and absorbing and redirecting force. The beauty of this kind of training: You can develop great abs without really thinking about it. Focus on challenging, fun, moves that remind you of your days as a high school/college athlete, and you’ll recover the six-pack you haven’t seen since then. Perform the exercises as a circuit. Complete one set of each in turn without rest and then rest 60 seconds at the end. Repeat for three total circuits. Sets: 3 Reps: 12 Rest: 0 sec. Suspend yourself over the parallel bars at a dip station. Bend your knees slightly and raise your legs in front of you until they’re parallel to the floor. Kneel on the floor and hold an ab wheel beneath your shoulders. Brace your abs and roll the wheel forward until you feel you’re about to lose tension in your core and your hips might sag. Roll yourself back to start. Do as many reps as you can with perfect form and end the set when you think you might break form. Sets: 3 Reps: 10 Rest: 0 sec. Hold a medicine ball with both hands and lie back on the floor with your knees bent and feet flat. Perform a situp and then throw the ball into a wall in front of you (or have a partner catch it and then throw it back to you). Catch the ball on the rebound and begin the next rep.
Sets: 3 Reps: 10 (each side) Rest: 60 sec. Sit on the floor in the top position of a situp and, holding a medicine ball with both hands, extend your arms in front of you. Explosively twist your body to one side and then twist back. Alternate sides. Fitness training director Sean Hyson, C.S.C.S., assembled a team of the best trainers in the world to create boredom-beating, plateau-busting routines that cover any amount of time you have to exercise and whatever tools you have available to do it. Programs cover every body part, every implement (barbells, dumbbells, bands, etc. ), and cardio. There’s a nutrition plan, too.